How fast can YOU swim when chased by a crocodile? 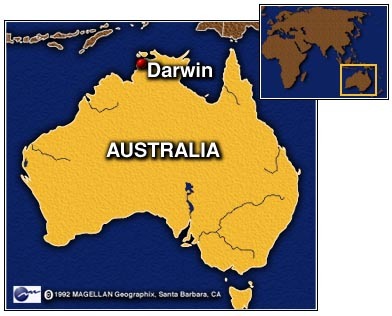 DARWIN, Australia (CNN) -- If you're hoping to make record time doing laps in the pool, perhaps you should consider employing a training technique that one swim instructor in Australia's Northern Territory claims yields record-breaking results: a crocodile. Swimming coach Mark Davies says his young swimmers are beating the clock, now that they're being chased by a hungry "croc." Davies says he lets his swimmers dive into the pool first. Then, he tosses in the crocodile. One young girl described the experience as "absolutely terrifying." Would you like to receive a weekly summary of Fringe news in your inbox? Sign up for Fringe Mail. 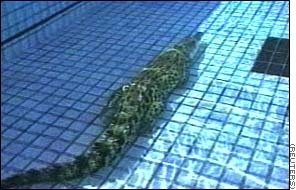 Davies says he checks the croc's swimming speed first, and makes sure the swimmer has enough of a head start that the crocodile can't really catch up.